Groupe Bertrand's collection of Charlie Birdy restaurants and bars across Paris are all good choices, but the Rue De La Boetie venue is particularly appealing for a post-event drink. It mixes comfy, pub-style armchairs with chic Parisienne style, and can be exclusively hired for groups of up to 220 for cocktails. Concorde La Fayette's new bar lives up to its namesake with fabulous views of the tower, best enjoyed with a cocktail in hand. The head barman promises original creations focusing on four key themes: dandies, women, history and creativity. 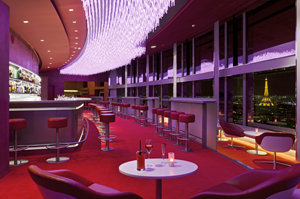 Ideal for a post-dinner after-party, with DJs Thursday to Saturday, the 34th-floor venue can also be hired exclusively for events. Part of the 23-room Jules & Jim Hotel, which opened last December, the bar is a cosy bolthole in the heart of the city, just a five-minute walk from the Centre Pompidou. Open to non-residents, the trendy venue boasts a stainless steel and walnut interior, but al fresco drinks can be enjoyed on its cobblestone courtyard, which has a crackling outdoor fire in the winter months. Follow in the footsteps of Orson Welles and Serge Gainsbourg at this history-rich venue, which packs plenty of character in a cosy setting. There are numerous Champagne and cocktail options - including Gainsbourg's favourite, a daiquiri, which groups of up to 80 can enjoy amid lavish red velvet and leather furnishings. However, be warned - its speciality drink is absinthe. Set in an 18th-century mansion, Le Club provides an elegant setting for cocktail receptions. The venue is next to the Assemblee Nationale on Rue de l'Universite, and matches its prestigious address with regal decor including wall tapestries and historic marqueterie wood flooring. It can hold groups of up to 100 for cocktails.